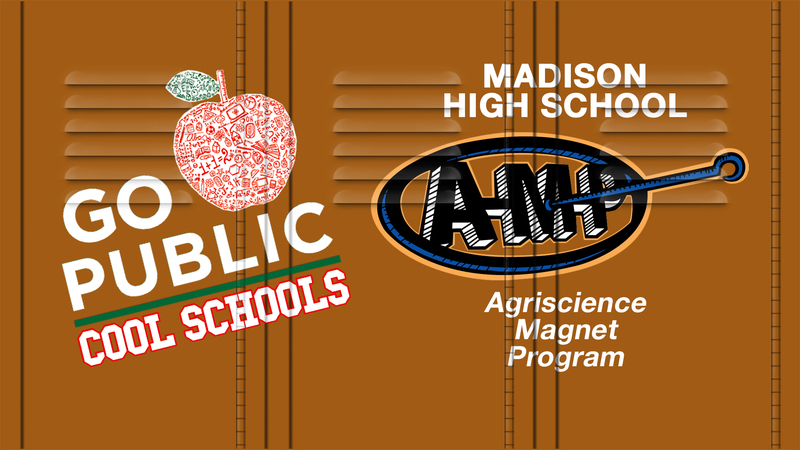 The AMP is located on the campus of James Madison High School and offers seven programs of study through experiential laboratories to include Agribusiness, Agriculture Mechanics, Animal Science, and Veterinary Technology. One agriculture experience that makes the AMP a ?Cool School? is our service dog program in which students raise and train puppies to become guide dogs for people that are visually-impaired. This very unique program (the first of its kind in Texas) is partnered with Guide Dogs for the Blind and began in June 2015 with 5 puppies. It has now grown to 24 puppies being raised and trained by students and the puppies are integrated into every part of our students’ lives. The puppies attend classes, football games, prom dances, pep rallies, tutoring, extracurricular activities with students – in short, the puppies are with the students 24/7 for approximately 15 months. After 15 months, the puppies are returned to Guide Dogs for the Blind for their final training in being a guide dog and hopefully becoming a life partner for someone that is visually-impaired. The AMP guide dog program has made a noticeable impact in the lives of our puppy raisers as they give of their time and talent to provide freedom for someone that receives one of the dogs. It has also educated students on the James Madison HS campus about the invaluable service that guide dogs provide and has made them more aware of how to interact with service dogs in our society. Vote for us!